Wait, is that what this is about!? Here are some ways that we have learned to help de-stress the holiday season. We celebrate Christmas in our home and … last I checked, that is just one day. I spent my childhood 50/50 with my divorced Mom and Dad. Add a husband and that math becomes more complicated. In the past, my husband and I put so much stress into making it to everyone’s home within that 24 hour period of Christmas and Christmas Eve … just to say that we did. By the time I had everyone ready, we packed the car, and then bickered about getting everyone ready and packing the car, there was not much Christmas spirit felt in that hour and a half car ride! Are the “Domaracki four” any less fantastic on December 12th? What’s with the 24-hour limit? Aren’t the holidays about seeing family and friends (period)? As our family grew, my relatives realized that all can just not be done in one day. That is why we have adopted “Faux Christmas” celebrations a week or two before the actual date on the calendar. We still spend Christmas day with family after our little family enjoys the morning together, but we no longer do the anxiety-filled holiday house hop. With growing families come growing gift lists. When it comes to gift giving, of course, the children come first! That is the best part of being a kid. But the adults need some love, too! On both sides of the family, we have a Secret Santa gift swap. We set a monetary limit, and choose names out of a hat. As our children play with their opened gifts, we exchange ours. This helps to cut down your gift list and save some dough. I love receiving cards from family and friends. (For those not on social media) seeing an annual Christmas photo is how I keep up with how fast everyone is growing. … And those old schoolers who still send written notes … you know that jingles this hand-writing lover’s bells! STILL, I think that the whole Christmas card thang has turned into yet another parental competition. Who sends their card first? Who does not send one at all? Unnecessary holiday-time stress! Being a card designer, many expect me to design my own Christmas cards each year. It’s a lovely thought, but ain’t nobody got time for that! Here is my advice: Nix the matchy-matchy family photo where all are simultaneously smiling and looking into the camera. Search through your phone for a recent pic where each family member is looking pretty good. Upload the pics into a digital card website of your choice (we have used Walmart in the past.) Send that baby to print! I start to think about preparing our family card right about now, after the Thanksgiving holiday. When the completed cards come in, they come in. No stress! We keep contacts for our family and friends in a label document. Once information changes, we update it immediately so I do not have to think about it later on. Adhering labels and postage stamps is a great job for the kids. Donzo! Holiday card stress averted. Three items down. Now, you can worry about other holiday tasks — like what to do with that freakin’ elf tonight! 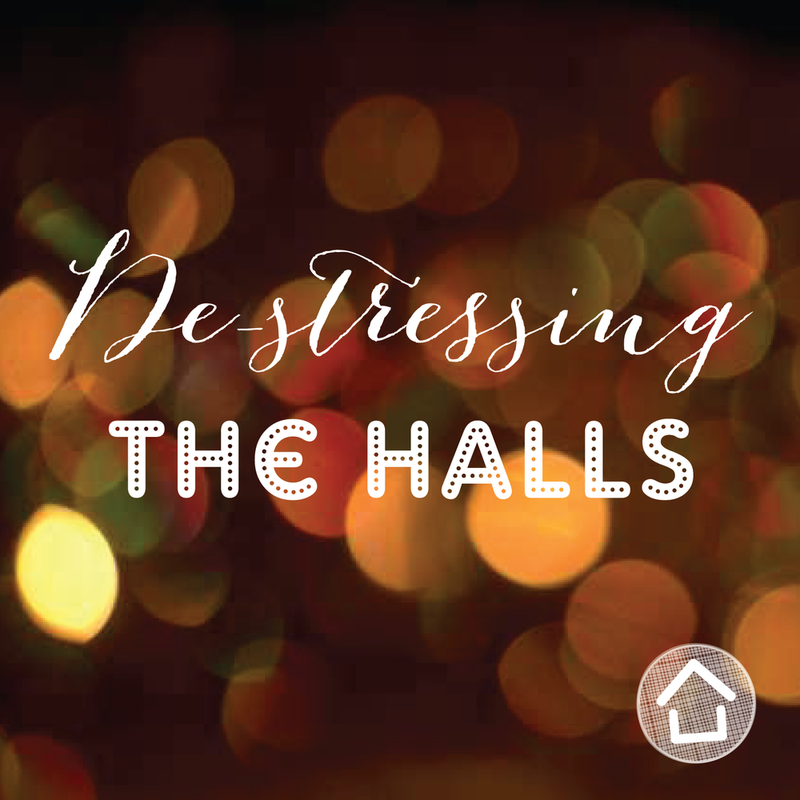 What do you do to de-stress throughout the holidays?